More than 600 counties in 36 states now are able to record documents electronically, according to the Property Records Industry Association (PRIA), a coalition of government agencies and businesses within the property records industry. The announcement preceded PRIA’s Annual Winter symposium held March 2-4 in Washington, DC. Electronic recording — or eRecording — is the automated process in a land records office of receiving, recording and exchanging documents and information in digital form. The trend also signals a potential increase in opportunities to have land records electronically notarized and could help drive the expanded use of electronic notarization because so many notarizations involve real estate-related transactions. “It’s exciting to see so many counties embracing this technology” said PRIA President Richard Bramhall. eRecording improves the quality of information recorded and reduces turn-around times, providing significant cost savings over manual recording processes. Notary Service And Bonding Agency Inc., an online supplier of public supplies, stamps, notary public seals and notary record books, has announced low cost notar. 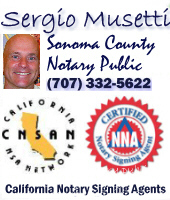 Petaluma Notary. Advertising, Wantedwants, Alexa ranking? Online webcam notarization is invalid and illegal in the State of California. A private company claims to have the first online notarization website and has sent misleading information and made false claims to California notaries public concerning a new online notarization service. The web-based platform purports to allow a person to submit copies of identification over the Internet and to use a webcam in lieu of a personal appearance in front of a notary public. Appearance via webcam does not meet the requirements for notarization in California. California notaries public are authorized under current law to perform electronic notarizations as long as all the requirements for a traditional paper-based notarial act are met, including the use of a seal for all but two specific documents used in real estate transactions. California law requires a person to appear personally before a notary public to obtain notarial acts like acknowledgments or jurats. This means the party must be physically present before the notary public. A video image or other form of non-physical representation is not a personal appearance in front of a notary public under current state or federal laws. The technology solution offered by this private company does not comply with California law.